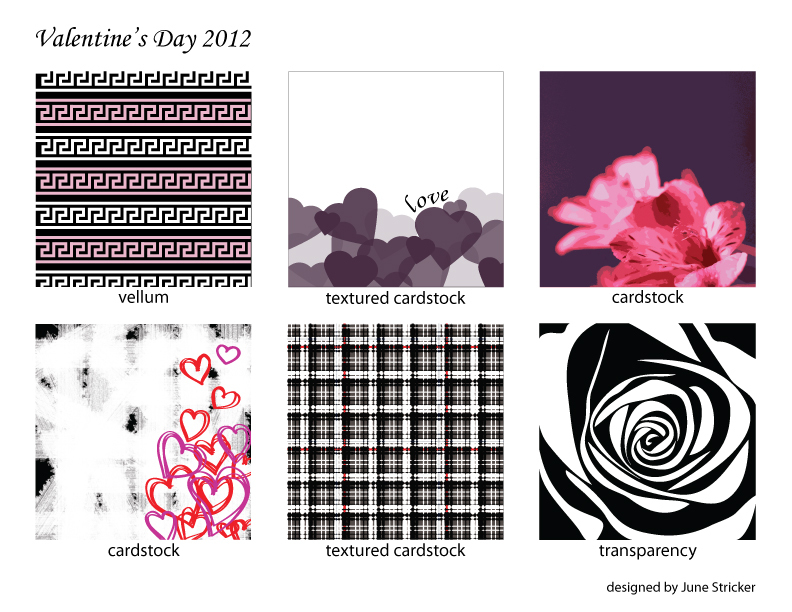 In January, I began to think about Valentine’s Day and possible card ideas. I knew I’d use my Slice Elite, a portable die-cut machine by Making Memories. I’ve had it since June, and while the company has had to replace a Halloween-themed design card and the machine altogether (I’ve had great service experiences each time), this little machine is my crafting sidekick. I have the wedding-themed and “Je t’Adore” design cards and was eager to use them. As I thought about what I could create, a light bulb turned on somewhere in the recesses of my mind. I could design my own patterned paper! I have a graphic design minor, so why not use it for card making? Why hadn’t I thought of this before? After a little time spent in Adobe Photoshop and Illustrator and a little money spent on cardstock, vellum and transparencies, I had a set of 6-by-6-inch patterned papers. When I created them, I didn’t have particular card designs in mind, but I’m happy with the results (see my gallery). I used the two Slice design cards mentioned and also thought of a use for the lobster on the “Bon Appetit” design card. Below is my card and a tutorial on how to make it. This design can be used for more than Valentine’s Day, such as an anniversary. My husband loves the card, and I had fun making it! This entry was posted in Love, Valentine's Day and tagged anniversary, lobster, Making Memories Slice, pattern design, romance, Valentine's Day. Bookmark the permalink.